William Shakespeare is the World’s most famous playwright and yet, surprisingly, very little is known of the man himself. His exact date of birth is unknown, although records show he was christened on 26th April 1564, in Stratford-upon-Avon (his adopted birthday is recognised as St Georges Day 23rd April). William was the third of eight children, born to John Shakespeare, a glove maker and wool merchant, and his mother Mary Arden, the daughter of a prominent landowner. By the time young William was four his father had become the Bailiff – the equivalent of Mayor. William first attended a Petty School (infant school) between the age of five and seven to learn basic education such as respect for parents, saying his prayers and table manners. His main education followed on at King Edward IV Grammar School, where he was taught Latin and Greek. Most of the teachers were Catholic, so it is possible that Shakespeare could have been influenced by their beliefs, although none of his works ever revealed any religious persuasions. William was withdrawn from education in 1577 at the age of fourteen due to his father’s financial problems. In November 1582, at the age of eighteen, William married twenty-six-year-old Ann Hathaway, eight years his senior, the daughter of an old family friend. There was a speedy marriage after only one reading of the banns, this was because Ann was already pregnant with Shakespeare’s child. Susanna was born in May 1583. How Shakespeare intended to support a wife and child is unsure. Stories that he was a deer-poacher have been discredited as a contradiction. It is said to be more likely he became a schoolmaster before seeking his fortune in London. 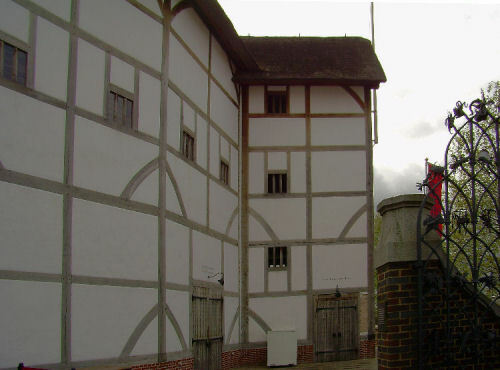 The first London theatre was built in 1576 at Shoreditch. The owner, James Burbage, built his theatre on the site now occupied by 86-88 Curtain Road, naming it simply ‘The Theatre.’ Today a brown Hackney Council plaque marks the spot and also recalls the other playhouse, ‘The Curtain’ which was built soon afterwards nearby. The year when Shakespeare first arrived in London is generally accepted to be 1584 when aged only twenty. 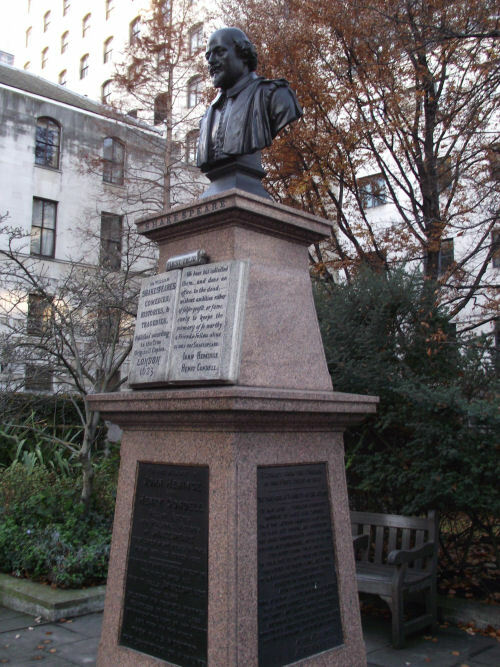 He first took up residence at St Helen’s Bishopsgate, within easy reach of ‘the Theatre at Shoreditch.’ The only surviving relic Shakespeare would have been familiar with which escaped the Great Fire of London in 1666 is the church of St Helens which would have been his local parish church. 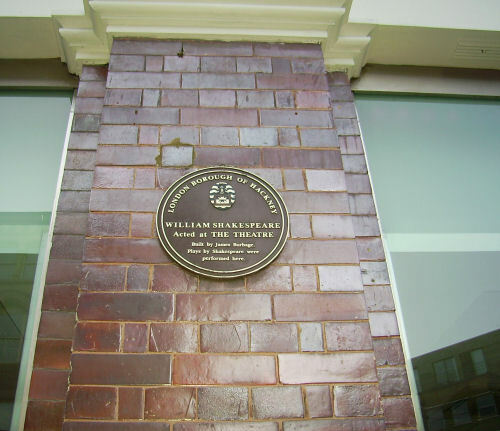 Whilst living at St Helen’s, Shakespeare joined “The Theatre” as part of the Lord Chamberlin’s men, working alongside the greatest actor of the time, Richard Burbage, the theatre owners’ son. By 1592 Shakespeare had already written three plays; Comedy of Errors, Taming of the Shrew and Two Gentlemen of Verona. Shakespeare did both acting and writing and was put on the role of tax-payers, becoming liable to an aggregate sum of £2 13s 4d for each of three subsidies voted to the Crown by Parliament in 1593. He was still left owing his tax and by the autumn of 1596, he moved south of the river to the ‘Borough’ in Southwark, close to the George Inn. It was there that the taxman came for payment of tax arrears, whereby he paid an instalment of 5s the next year and another 13s 4d the year afterwards. We know of no other tax payments ever being made anywhere by him after that. The reason he moved south of the river was not simply to dodge the taxman, but because The Theatre at Shoreditch was under threat from the leaseholders. Burbage the owner along with the cast of actors carried the timber-built theatre and re-erected it where Park Street now stands, just across the road from the rear entrance of the financial times. This is a good place to stop and look, for this is the only outside site in London, where markers visually show the outline of the original Shakespeare theatre, The Globe. In those times the river had no embankment, and therefore it ran wider than its present width. 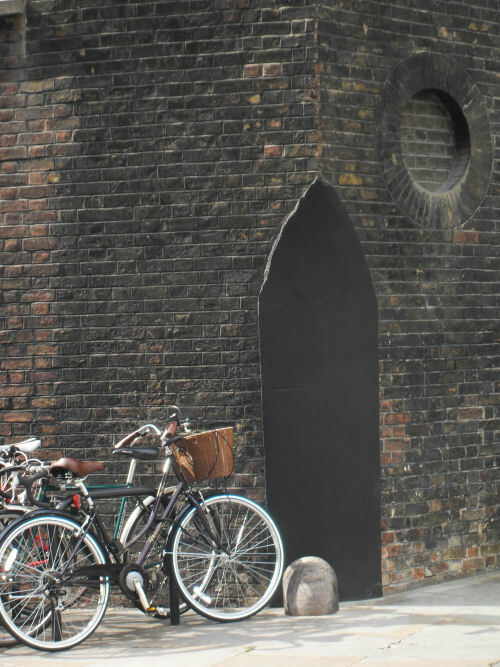 If you were to go along Bear Alley at the side of a modern building, you will find the Ferryman’s Seat – which dates back to Elizabethan times. Waiting for the Globe to burst, would have sat I am sure, a descendant of us taxi-drivers waiting for a fare back to the City. After all, there was only one bridge crossing the river – London Bridge – so taking a punt would be a very popular alternative! Southwark Cathedral or St Mary Overie (meaning St Mary’s over the river to distinguish from St Mary’s in the City) would still be recognised by Shakespeare today. The church was rebuilt after a fire in 1212 and has remained virtually unchanged. 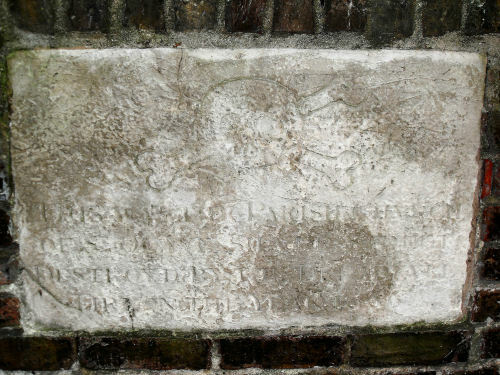 Edmund, Shakespeare’s younger brother, was buried here in 1607, and although the position of Edmund's grave is unknown, he is commemorated by an inscribed stone in the paving of the choir. In 1603 as Shakespeare was approaching forty, he became a lodger to a Huguenot wig and head-tires maker named Christopher Mountjoy. The Mountjoy house stood on the corner of Silver Street, a continuation of Addle Street, leading to Noble Street. This was the year when Queen Elizabeth died, and the same year as a savage outbreak of the plague, which caused the closure of the theatres. Plays thought to be written whilst he lodged here include; Othello, Measure for Measure, All’s Well that Ends Well, Timon of Athens and King Lear. Across the street from the Mountjoy’s house stood the small church of St Olave, which Stowe in his survey of London 1598 recorded; ‘the parish church of St Olave in Silver Streete, a small thing without any noteworthy monuments’. Shakespeare would have certainly worshipped here – whatever his religion or lack of any: regular church attendance was compulsory, and any shirkers were fined. Although Mountjoy’s house was demolished many centuries ago, Silver Street did survive as recently as World War II – with the Coopers’ Arms public-house taking the site of Shakespeare’s lodgings until it was bombed during the blitz. 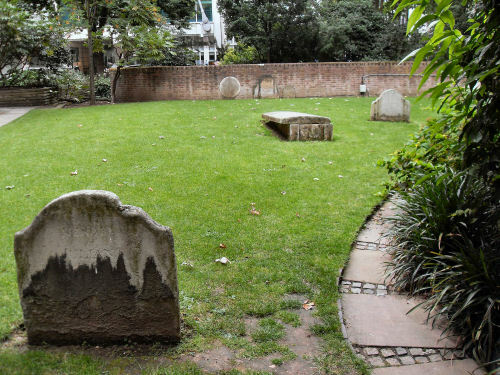 Today the only reminder of Silver Street, with its small churchyard, is the little gardens and a remaining commemorative stone and a couple of headstones. 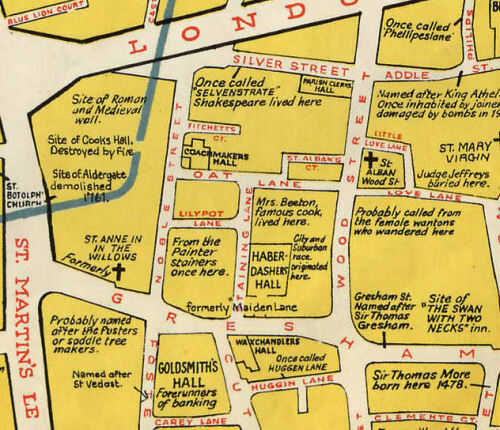 The land previously forming part of the Monastery of Dominican Monks or Blackfriars as they were known was dissolved by King Henry VIII as were all the monasteries of London. The vacant site within the city was just right to start a new theatre. Burbage, obtained rooms, large and small, with cellars and yards, including seven great upper rooms, formerly one great room, turning the rooms into a playhouse. It was in 1608 the regular players including William Shakespeare obtained a part ownership in the company. Other than the name Playhouse Yard there is very little evidence left to remind us of the theatre which once stood here, except for the small piece of black wall standing at the corner of the building, this is the only remains of this popular Elizabethan Playhouse. Ireland Yard, just behind Playhouse Yard, was the only accommodation in London owned by Shakespeare. The deed of purchase, dated 10 March 1613, made between the vendor, Henry Walker, Citizen and Minstrel of London, and William Shakespeare. The following day Shakespeare executed another deed stipulating that £60 of the purchase price was to remain on a mortgage until paid in whole the following September. Whether this sum was ever paid is unknown. Despite the detailed description in the deed it has proved difficult to locate the exact site of Shakespeare’s property. We know that it abutted on the street leading down to Puddle Wharf which is now St Andrew’s Hill. The Wardrobe which it was near or “right against,” is commemorated in Wardrobe Place. The present-day passage Ireland Yard, which runs west out of St Andrew’s Hill, undoubtedly derives its name from the Ireland family who owned or occupied property in the Blackfriars area at least as early as 1582. Walker leased the gatehouse to William Ireland, Citizen and Haberdasher of London, for 25 years. 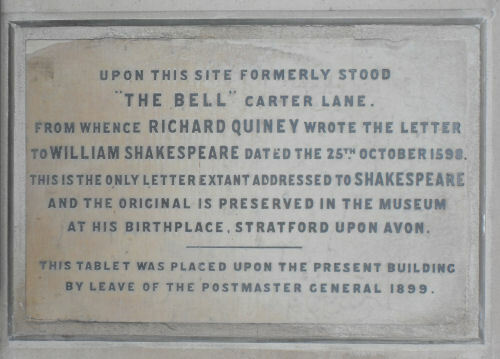 The exact date at which Shakespeare’s property passed out of the hands of his descendants is not known, but in August 1667, Edward Bagley, a kinsman of Shakespeare’s grand-daughter, Elizabeth Barnard, sold the site to Sir Heneage Fetherston. As the Blackfriars area had been razed to the ground by the Great Fire of the previous year, Bagley received only £35 for the land. Shakespeare said farewell to London in 1613 and returned to Stratford-on-Avon where he passed his days quietly. He did return at least one more time to London for a visit. He made his last will on the 25 March 1616 and died a month later on St George’s day, April 23rd. Shakespeare's grave is located in the chancel of Holy Trinity Church in Stratford. His wife, Anne Hathaway (who outlived her husband by seven years despite being eight years his senior) is buried at his side and that of their older daughter; Susanna Hall is also close by. 2. Shakespeare married Anne Hathaway when he was 17. She was 26 and she was pregnant when they married. Their first child was born six months after the wedding. Shakespeare and Anne Hathaway had three children together – a son, Hamnet, who died in 1596, and two daughters, Susanna and Judith. His only granddaughter Elizabeth – daughter of Susanna – died childless in 1670. Shakespeare, therefore, has no descendants. 4. One of Shakespeare’s relatives on his mother’s side, William Arden, was arrested for plotting against Queen Elizabeth I, imprisoned in the Tower of London and executed. < 5. During his life, Shakespeare wrote 37 plays and 154 sonnets! This means an average 1.5 plays a year since he first started writing in 1589. His last play The Two Noble Kinsmen is reckoned to have been written in 1613 when he was 49 years old. While he was writing the plays at such a pace he was also conducting a family life, a social life and a full business life, running an acting company and a theatre. 6. Few people realise that apart from writing his numerous plays and sonnets, Shakespeare was also an actor who performed many of his own plays as well as those of other playwrights. During his life Shakespeare performed before Queen Elizabeth I and, later, before James I who was an enthusiastic patron of his work. 7. Shakespeare is always referred to as an Elizabethan playwright, but as most of his most popular plays were written after Elizabeth’s death he was actually more of a Jacobean writer. His later plays also show the distinct characteristics of Jacobean drama. 8. Almost four hundred years after Shakespeare’s death there are 157 million pages referring to him on Google. There are 132 million for God, 2.7 million for Elvis Presley. 9. Some of Shakespeare’s signatures have survived on original documents. In none of them does he spell his name in what has become the standard way. He spells it Shakespe; Shakspe; Shakspere and Shakespear. 10. It was illegal for women and girls to perform in the theatre in Shakespeare’s lifetime so all the female parts were written for boys. The text of some plays like Hamlet and Antony and Cleopatra refer to that. It was only much later, during the Restoration that the first woman appeared on the English stage. 11. Shakespeare was never painted during his own lifetime; therefore no one knows for sure exactly what he looked like. 12. Many of Shakespeare’s plays were set abroad in Italy and yet there is no record that he ever set foot in any other country.